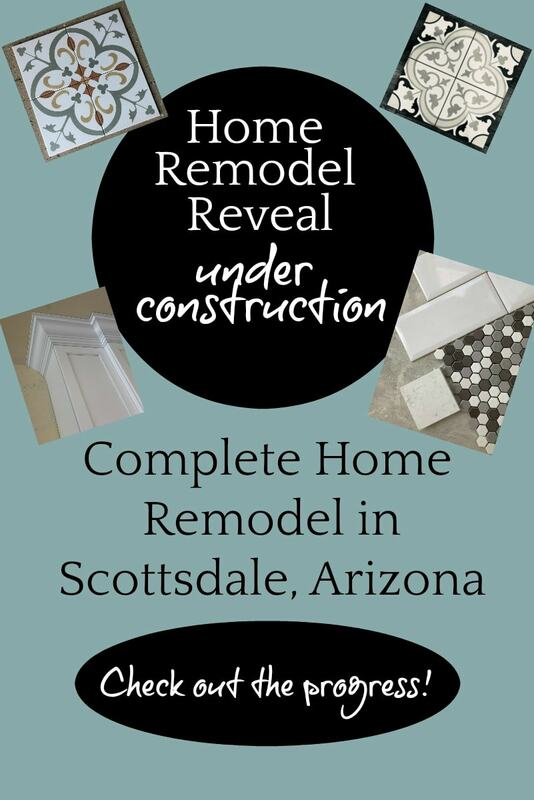 We’ve been very busy on our Scottsdale Home Remodel! 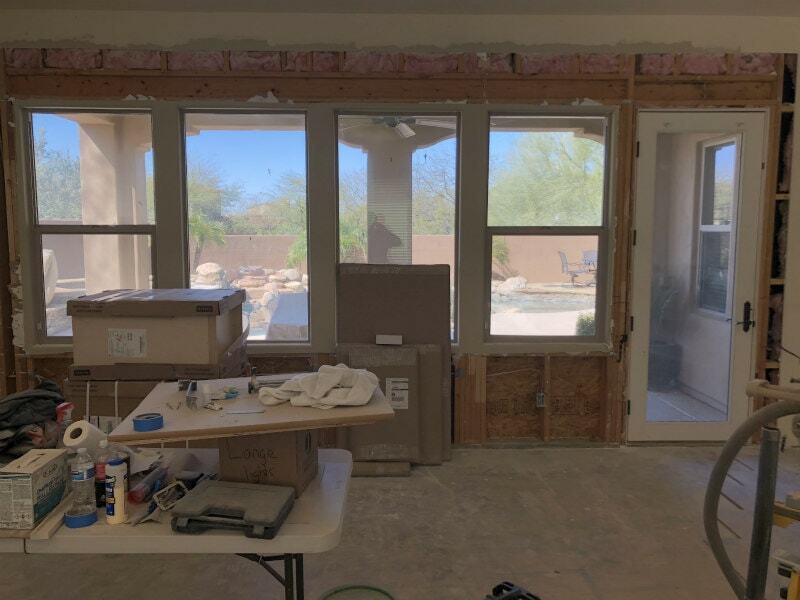 This is a remodel on the home we purchased in North Scottsdale, Arizona. 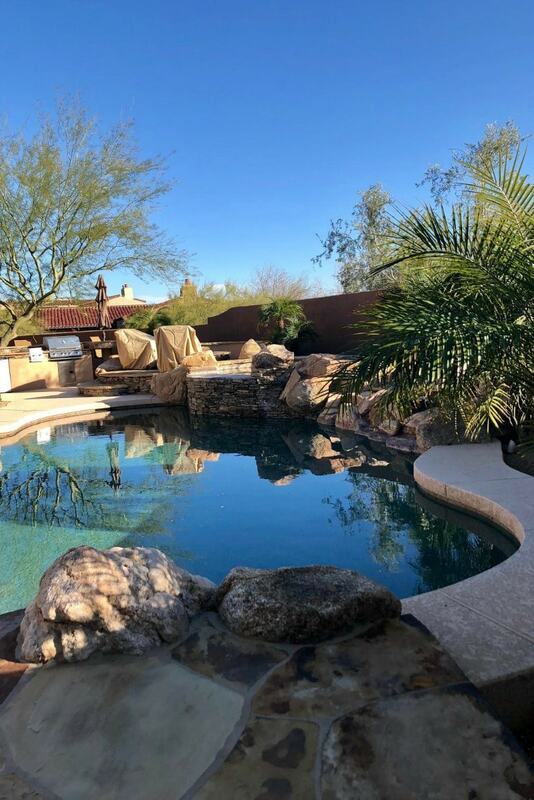 We’ve rented here in Scottsdale for the last two years, so we are excited to finally have a home to call our own. This project began in mid-December, and we’re finally inching toward completion. I’m looking at the house today and wondering how we’re going to move into this place in just four weeks, but I’m confident it’s going to happen! 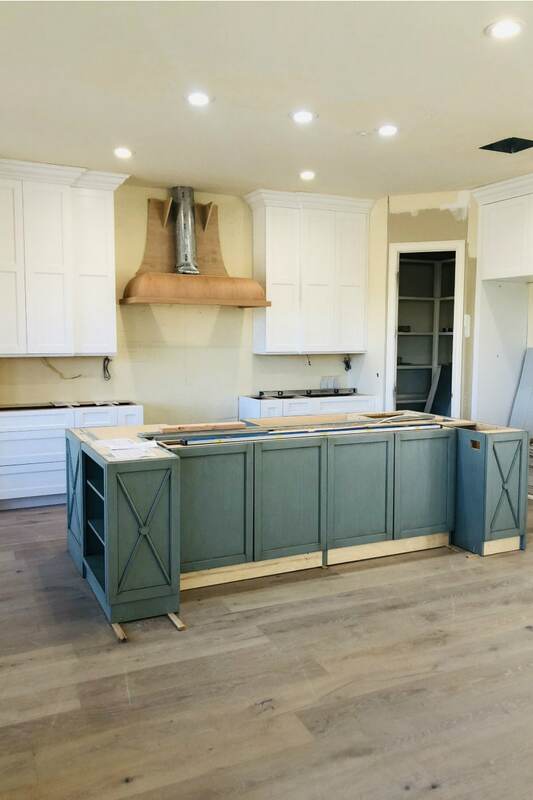 We’re still waiting on countertops to be fabricated and the kitchen appliances are “scheduled” to be delivered in early April. 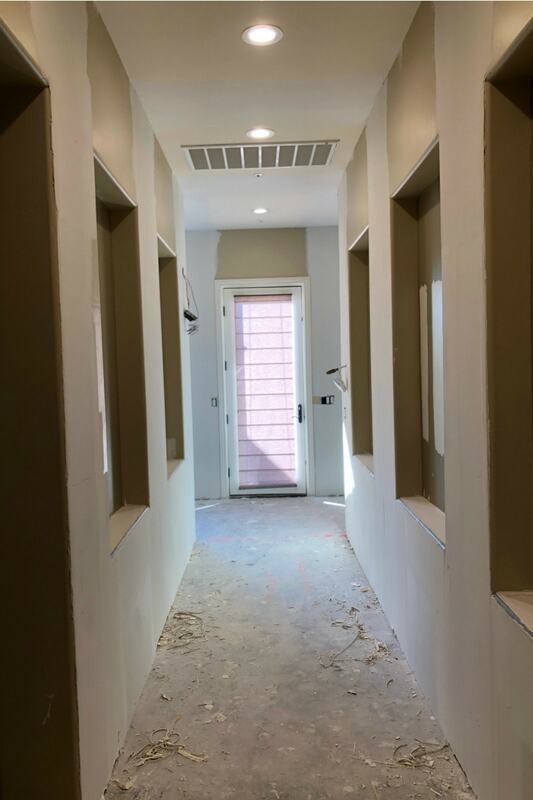 The plumber needs to get everything hooked up, the electrician needs to install chandeliers and ceiling fans, the painters still need to paint, and we have no carpet in our master bedroom! But I feel like everything is going to come together rather quickly and it will all be fine. Wishful thinking? 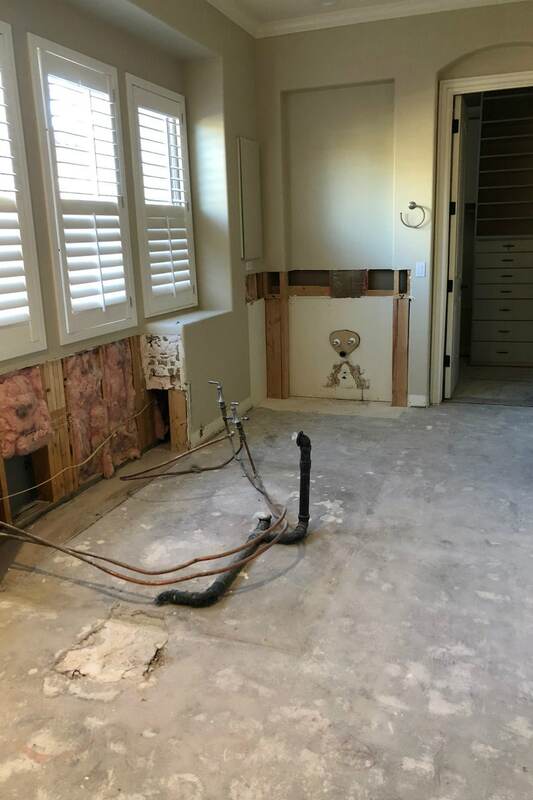 This is the before pic of our Master bathroom. It would have been totally fine and we could have lived with it this way… but it didn’t fit the light and bright farmhouse-style vibe that we hoped to create in our home. The jacuzzi tub here might seem nice and all, but it literally took up half the bathroom. Not good. So we took it apart! It’s not done yet, but you can get an idea of what it’s going to look like here. 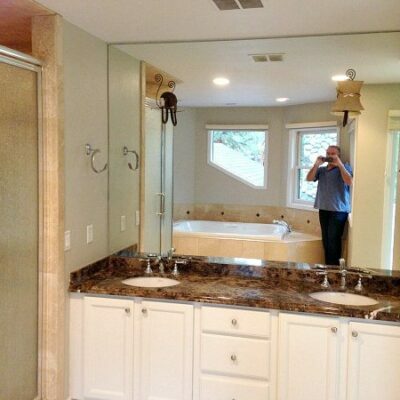 The bathtub is going to go in that space you see on the left. 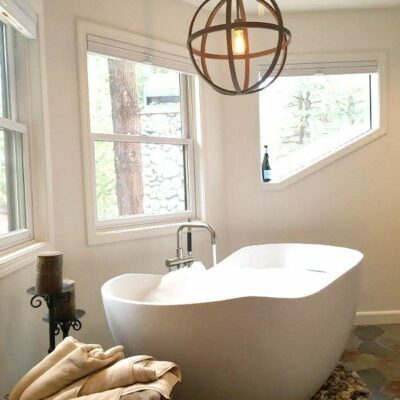 It’s a freestanding tub, and it will take up so much less space than the jacuzzi tub did. The cabinetry there is light gray, and it’s from Cabico Cabinetry. 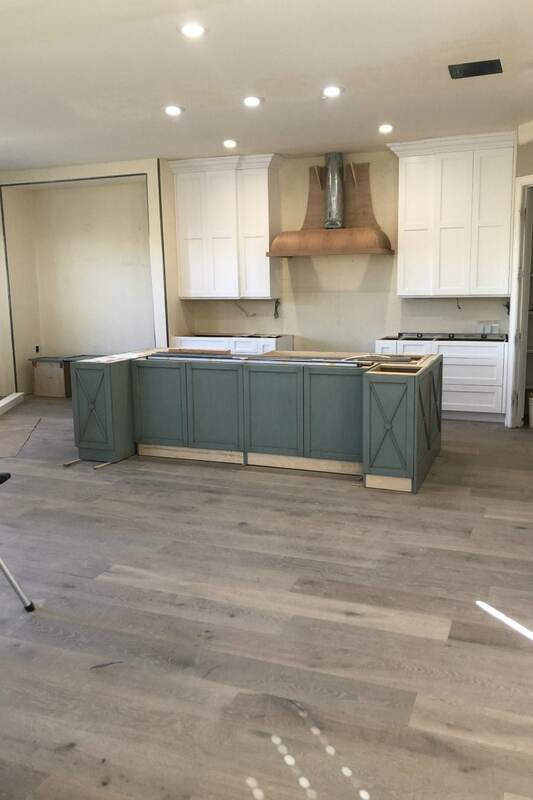 I’m so happy with the color we chose, and it looks great with the colors in the floor. 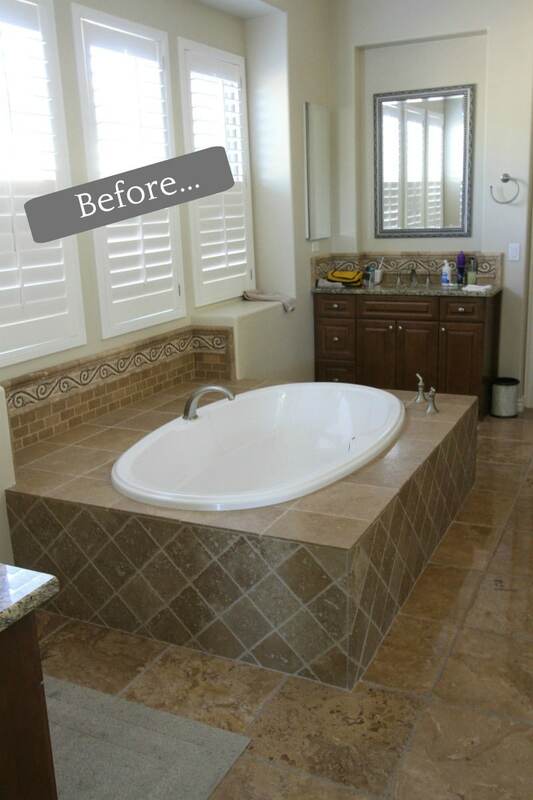 We chose this tile from Cactus Stone and Tile here in Scottsdale. I LOVE IT. 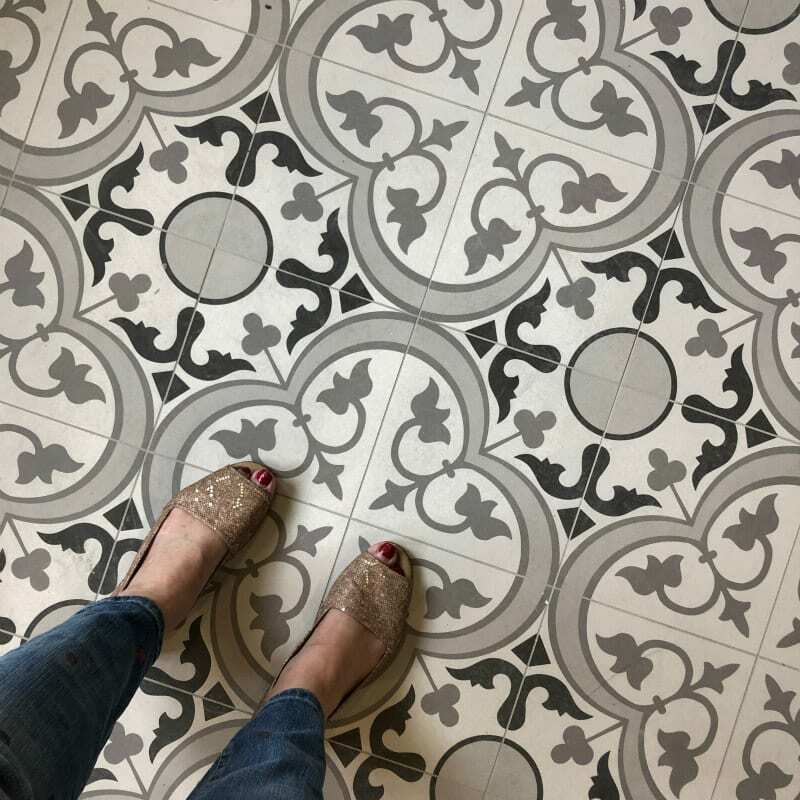 Note: I spotted this same tile at one tile store and loved it. But it was more than I wanted to spend. I walked in to Cactus Stone and Tile, and saw the exact same tile for a much better price. SOLD! 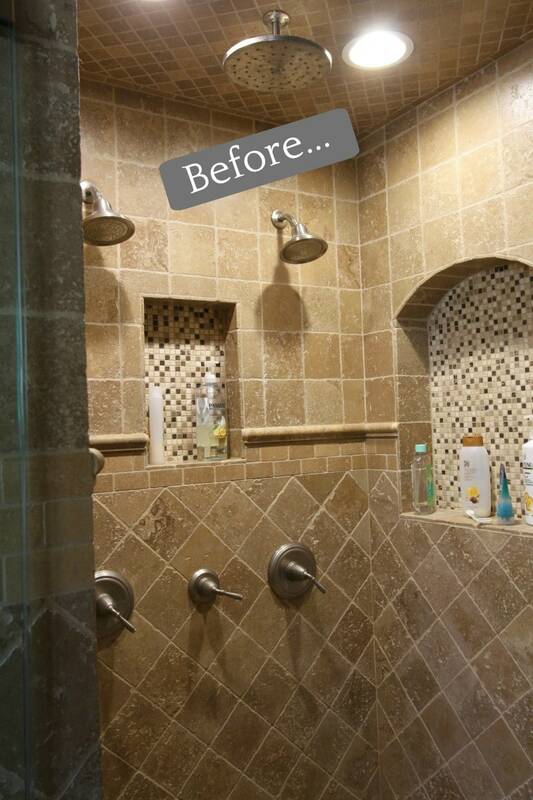 Again, this bathroom shower we could have lived with… but it didn’t fit the style we wanted. 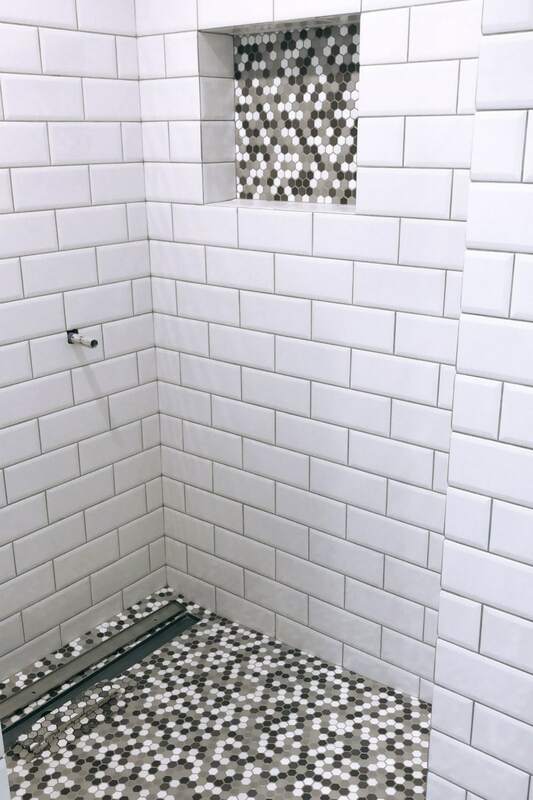 Since it was so nice already, we actually did try to find tile for the rest of the bathroom that would still go with this shower if we kept it… but we weren’t successful finding anything that would work. And now it’s light and bright. The white/gray/black colors go with the rest of the bathroom. We relocated the drain to the side and made it one of those long drains. 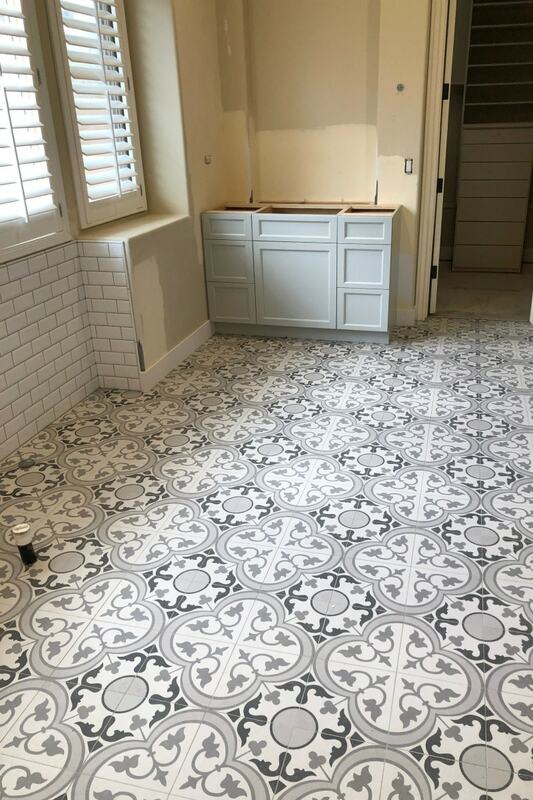 The white tile is from Floor and Decor, and I took a chance and bought the hexagon tile sight unseen on Overstock.com. This was definitely an area of the bathroom that I didn’t want or need. Does anyone sit down at a vanity and get ready in the morning? Not me! So we took this area out too. We replaced it with more storage cabinets. There will be a clothes hamper in the middle there. I’m so happy to have more storage in the bathroom. I’ll put all of my towels in linens in there. And maybe use those drawers for workout clothes, etc. 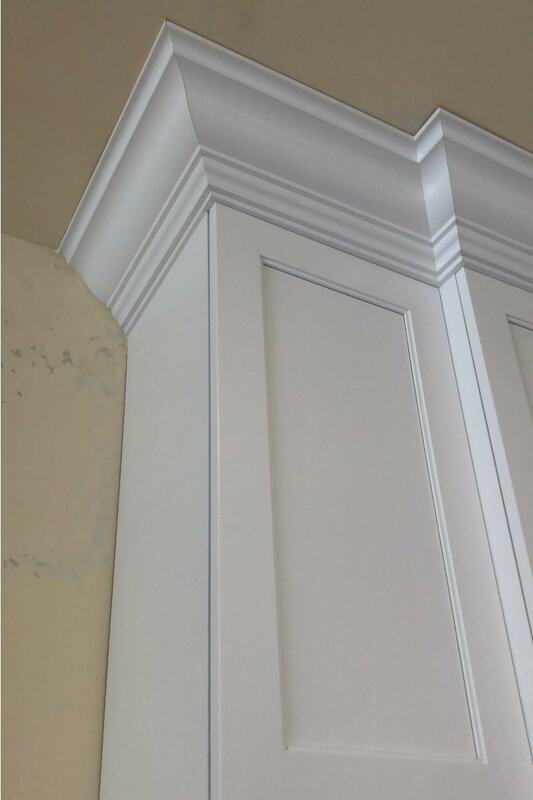 Again, these cabinets are from Cabico Cabinetry. 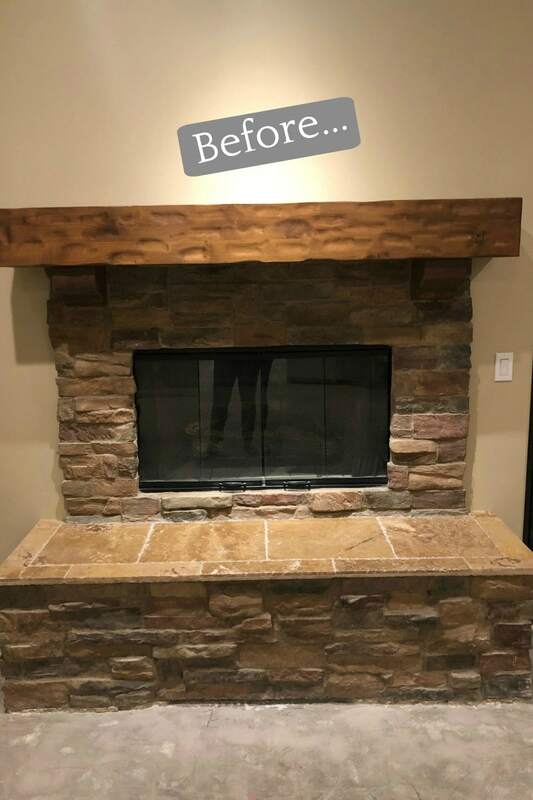 The fireplace was old and dated. We tried to work with it the way it was by painting it white, but it just wasn’t going to look good. So we took it apart! It’s not done yet, but you can see the tile that we chose: leathered marble from Cactus Stone and Tile. It’s beautiful! This same tile will be laid all the way up to the mantle (which we still need to build). The surface of the hearth will be a slab of gray quartz. 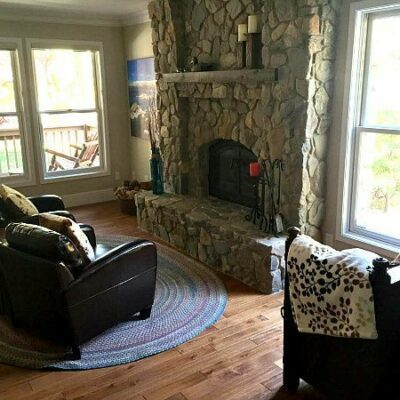 Leslie from Leslie Paige Interiors helped us with the design of the fireplace. I think it’s going to turn out gorgeous! 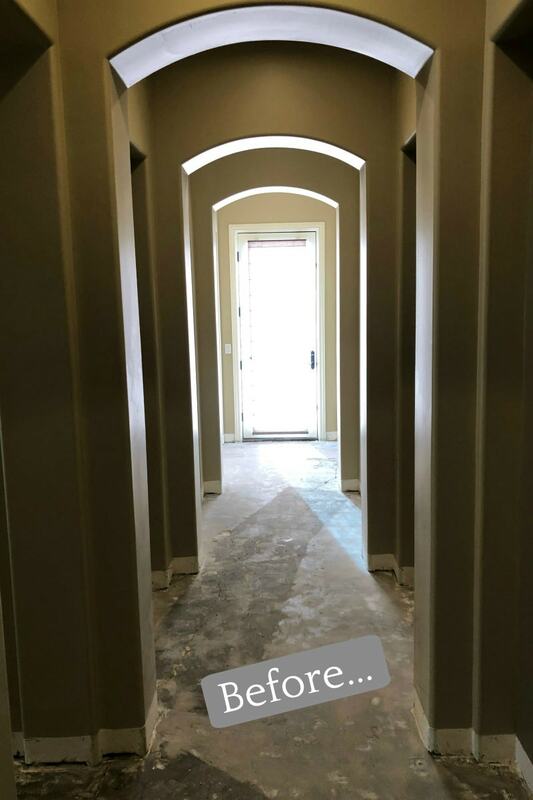 In all of these older houses here in Scottsdale, you’ll see plenty of arches. The arches are totally pretty in some homes I’ve been in. I envy the people who can decorate an area like this so it looks good. I felt like the arches really closed in the hallway here and made everything look so dark. So we took the arches out! Huge difference. The hallway is now light and bright, and everything is opened up and looks so much bigger. I guess I’ll probably put family photos and things in those little nook areas. My son looked at this photo of the kitchen and said, “Mom! 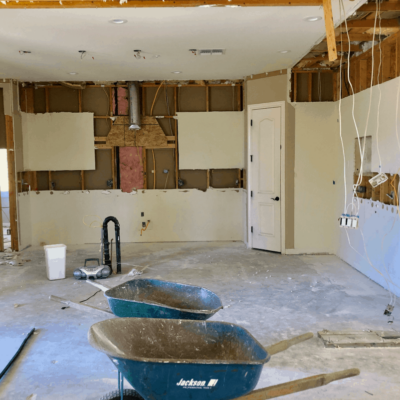 It looks fine… why are you remodeling it?” Well, I’m sure I could have lived with the kitchen as it was, but it wasn’t at all what I wanted. The cupboards were old and worn, the refrigerator was in an odd place, and I didn’t love the flooring or the black “bar” area. Note that the cabinets did not go all the way to the ceiling. That changes in the remodel. Also note the flooring because I’ll be showing you the new flooring a few photos down from this one. This was our drywall guy, who did an amazing job. 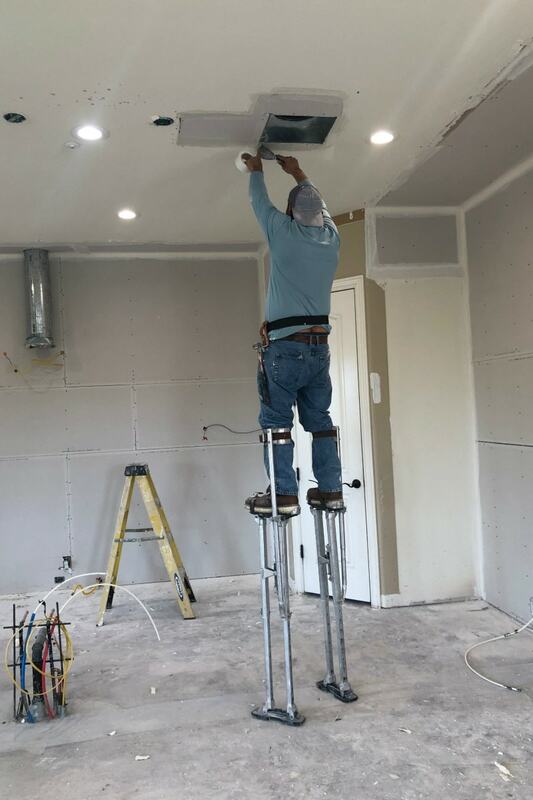 I can’t even imagine standing on these stilts all day patching up the walls and ceiling. That’s talent! 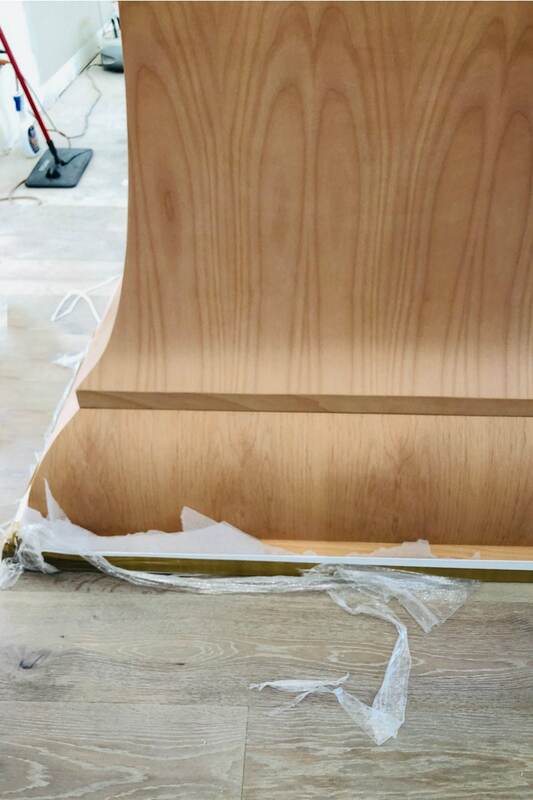 And then we began the process of installing the new cabinetry. 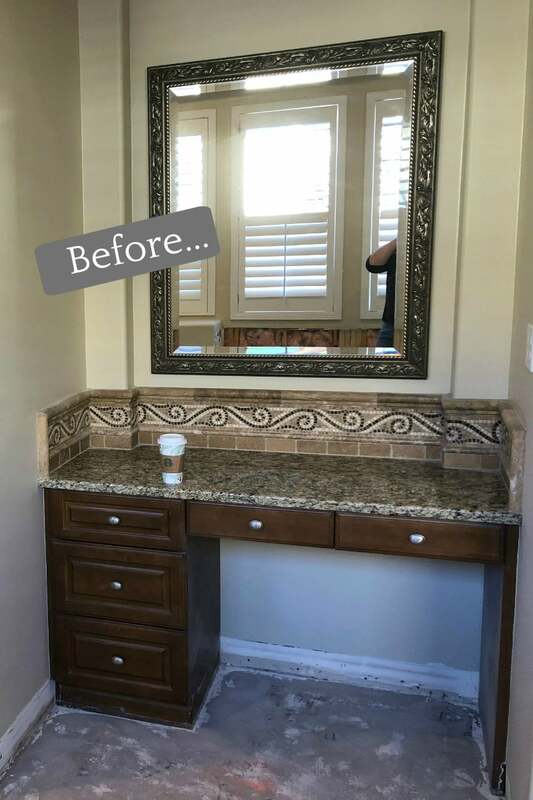 We worked with McKenzie Architectural Kitchens here in Scottsdale on the design of the new layout of the kitchen, and they assisted us in choosing new cabinetry too. We went with Cabico Cabinetry all around. The white cabinets are from their more standard line. And the island was a little more custom- Cabico’s Elmwood Series. The green is like a seafoam/sage color. I’m excited to bring that color into the rest of the kitchen and adjoining family room as an accent. McKenzie has been a breeze to work with! Note the flooring we purchased from Metro West Wholesale here in Scottsdale. We chose French Oak “Moda” from the Mediterranean Collections by California Classics. The floors are pretty dirty right now with all of the construction still in progress, but they will be beautiful when they are clean again! We are still waiting on the countertops and KitchenAid appliances. Those should come in very soon! I love that the cabinets are all “soft close.” That means you can just push them and they’ll slowly soft-close instead of slamming shut. These shelves here will house my favorite cookbooks! 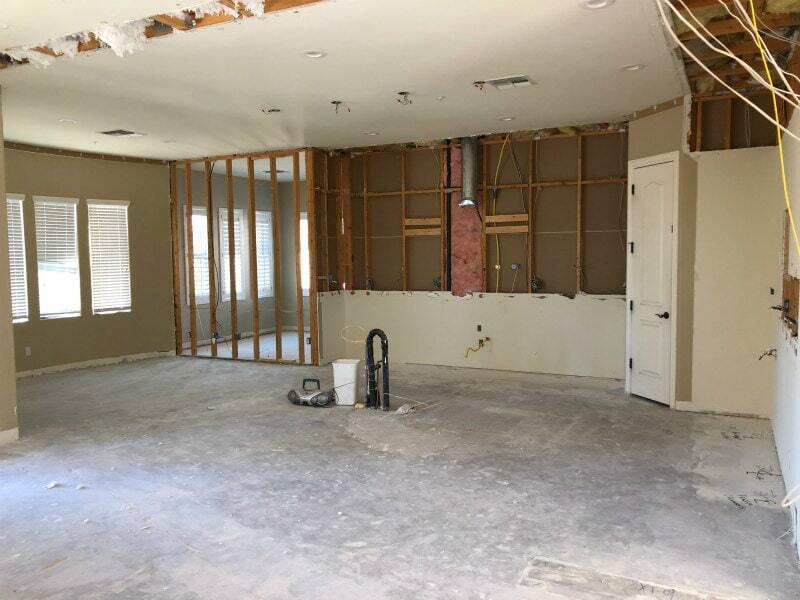 The area you see in the back– on the left is a small pantry, the refrigerator has been relocated to the left (in the previous kitchen, it was on the far right). 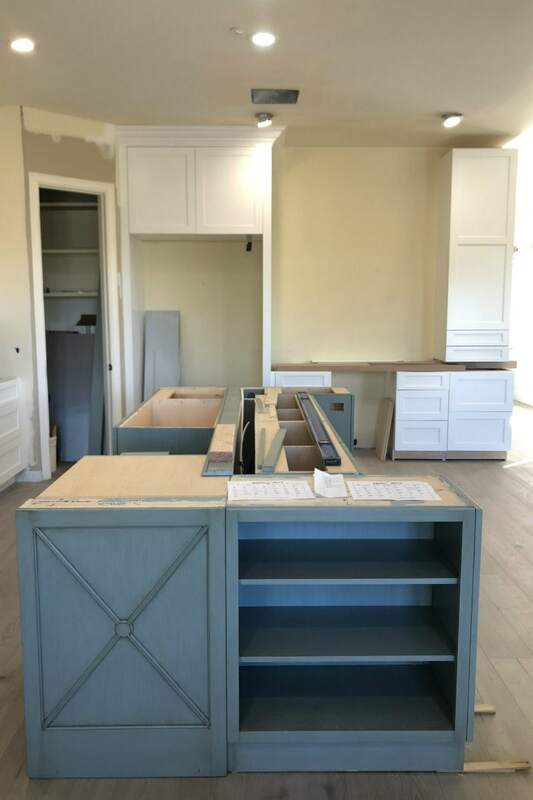 There will be a bar area to the right of the fridge, with a sink, refrigerated drawers and shelving above. 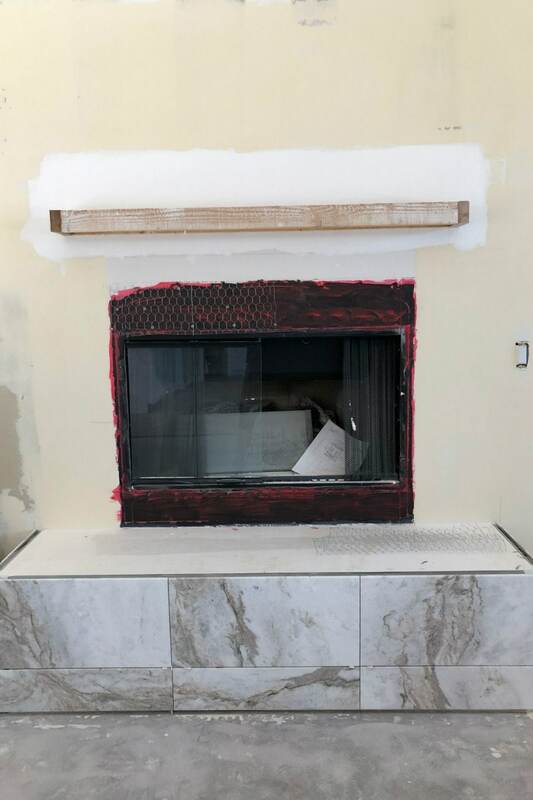 We’ll also be incorporating a floor-to-ceiling glass wine wall from Innovative Wine Cellar Designs in the space to the right of all of the white cabinetry, but that has yet to be built. So excited about that design feature though! I love that our cabinets go all the way to the ceiling! 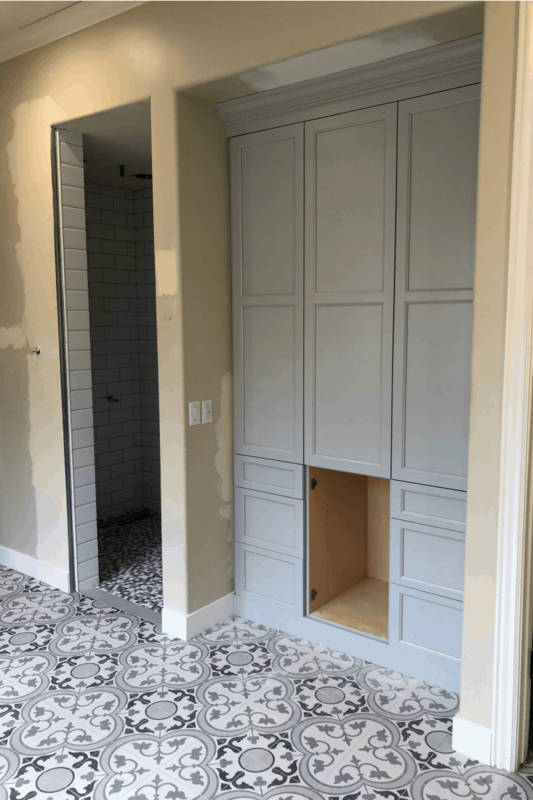 That wasn’t something I had thought of, but our kitchen designer Catherine from McKenzie Architectural Kitchens recommended it, and I’m so glad she did. It really makes the kitchen look bigger, and there is so much more storage available. 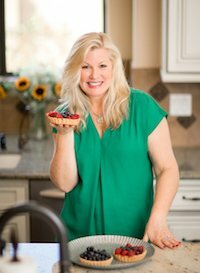 I plan to store many of my entertaining supplies in those way-up-high cupboards since I won’t need those things that often. This is a peek at our range hood. 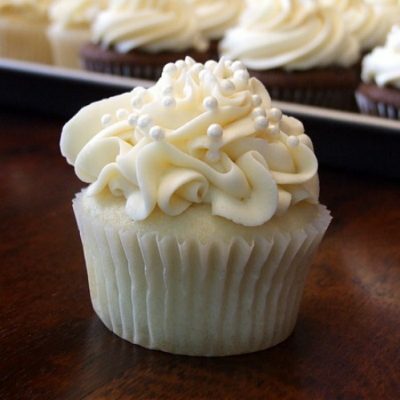 It will be glazed a different color, so this isn’t the final look. But isn’t the design gorgeous? Kitchen designer Catherine helped me choose this showpiece. I can’t wait to see how it turns out! 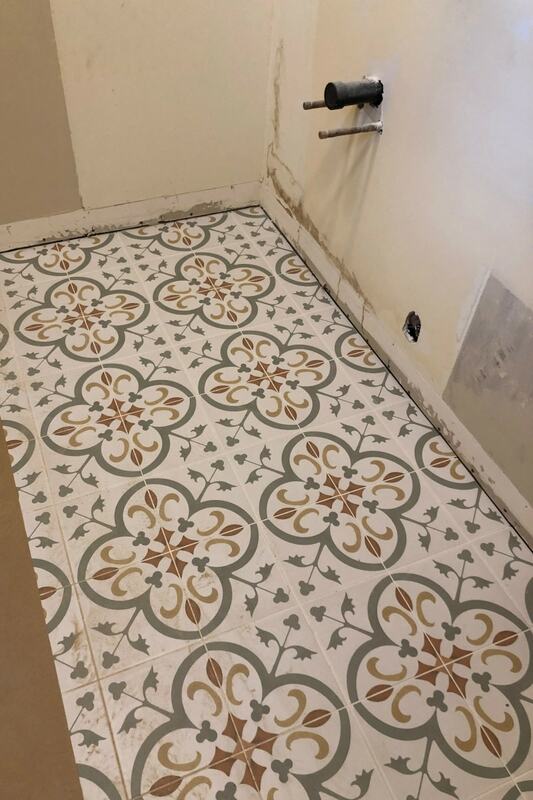 Here’s a little peek at our (dirty) new tile in the laundry room. It’s very pretty when it’s clean. I found it sight unseen on Wayfair, and I was super happy with the colors and quality when it arrived in the mail! Excuse the mess, but this wall here is under construction. 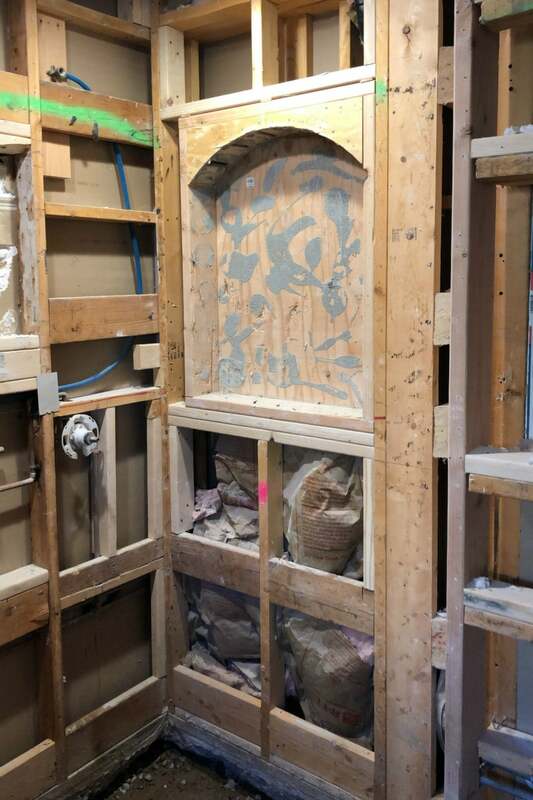 The wall will be taken out entirely and replaced with a folding GLASS WALL from NanaWall Glass Wall Systems. It’s going to open up our family room to the backyard, and it will be so nice to have open for indoor/outdoor parties when the weather is just right. There is much more to come, and I’ll be sharing the final photos and design and furnishings in the weeks to come. But for now, we just want to relax in our backyard oasis! Beautiful and coming along. Cant wait to see finished work. 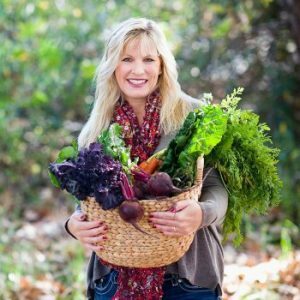 Are you no longer in Tahoe area? I hope you kept that house. Tahoe is my favorite place to go. So beautiful!!! Thanks! We sold our house in the Tahoe area and moved to AZ! It’s almost ready for move in! Wow! So happy for you and your remodeled digs! Enjoy! Thank you, it’s coming along! 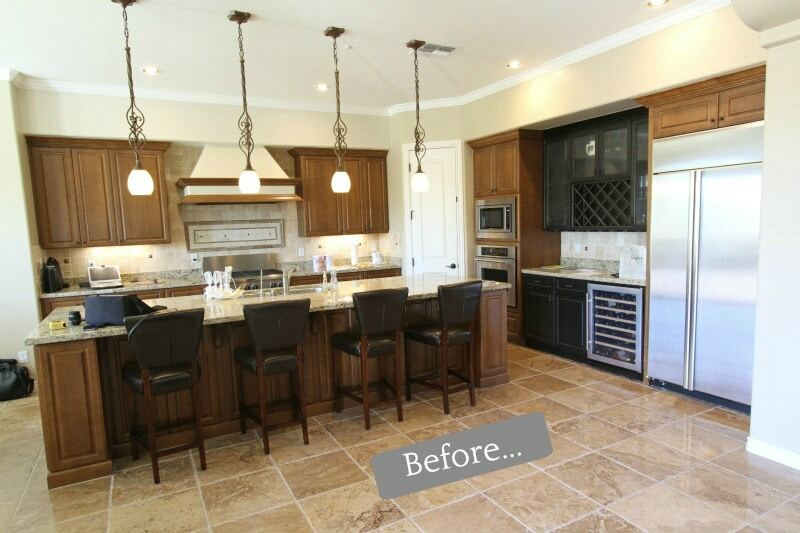 Your house transformation is huge but it is going to be so beautiful! Thanks for sharing your life with us. I can’t wait to see the end results. 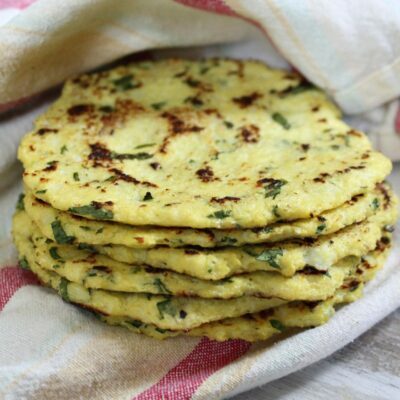 I love your cookbook. Oh, thank you so much. Glad you are enjoying my share! be patient my friend, your house will be AMAZING!!! Absolutely gorgeous!! I love your style and colors! Have fun entertaining and making lots of memories in your beautiful new home! Can’t wait to see the finished product!